Unilens Vision designs, produces and sells specialty contact lenses. These lenses include torics, multifocals and other products for people with vision issues that rule out standard lenses. The eye care industry is highly competitive, but Unilens has managed to churn out steady profits and free cash flows over the last decade. The company was formerly headquartered in British Columbia with operations in Florida, but became a Delaware corporation in 2010. Unilens Vision’s internal line of products is called “C-Vue.” The company’s sales of these lenses produces only a tiny operating profit, only barely enough to cover production costs and operating expenses in most years. The company’s real profits come from royalties on its multifocal soft contact lense technology, which was licensed to Bausch & Lomb in 2001. Unilens Vision receives royalties ranging from 2-5% on Bausch & Lomb’s sales of these lenses. The technology behind these lenses is patent-protected until November 2016. The company cautions that Bausch & Lomb is free to increase, decrease or even cease production and sales of these lenses at any time, and future royalties are completely beyond Unilens Vision’s control. Unilens Vision’s revenues and operating profits peaked in 2009 and have since retreated modestly. Here’s a look at the past decade’s results. Company sales (“C-Vue”) have remained largely steady since 2006, while royalties from Bausch & Lomb peaked in 2010 and have since retreated slightly. Unilens Vision seems incapable of producing organic growth in revenues and earnings. The company was awarded a new patent in November 2010, but conservative investors should not model growth into financial projections. Operating earnings have ranged from approximately $2.2 to $3.1 million over the past five years. However, the company’s balance sheet has changed dramatically in the interim, which has had a huge effect on net income and cash flow, both in absolute and per share terms. A brief history lesson is needed. Prior to January of 2010, Unilens Vision was 48%-owned by a European company, Uniinvest Holding AG. Uniinvest Holding AG was put into liquidation and Unilens Vision seized upon the opportunity to repurchase this extremely large block of shares at a substantial discount to market value. To fund this transaction, Unilens Vision drew $6.0 million on a five-year term loan facility through Regions Bank. Shares outstanding fell from 4.558 million to 2.369 million. Because of this transaction, Unilens Vision has been able to maintain earnings and free cash flow per share even in the face of gently declining revenues and the new interest expense associated with the debt. Over the last six quarters, free cash flow and earnings per share have remained steady at around 60 cents per share on a trailing twelve month basis. However, the company’s share price has fallen by about 27% in the last 18 months. The biggest factor in this decline is (in my opinion) the company’s dividend policy. Unilens Vision instituted a regular quarterly dividend in February 2007, at 7.5 cents per share. This amount was raised to 9 cents per share in August of the same year. All was well until April 2011, when the company announced it would cut its dividend in half. A look at the company’s stock chart reveals a precipitous decline beginning then. Typically, a company will only cut its dividend in response to severely challenging economic conditions combined with a poor free cash flow outlook. Companies that cut dividends are usually punished by investors, often rightly so. In Unilens Vision’s case, however, the dividend cut was simply the result of a change in loan terms, not financial distress. In consideration for reduced principal payments and additional equipment financing from Regions Bank, Unilens Vision agreed to cap dividend payments at 4.5 cents per quarter, with higher amounts requiring the lender’s approval. In May 2012, Unilens replaced its Regions Bank term loan with one from Hancock Bank. The Hancock Bank loan has fewer restrictions on dividend payments. Under its terms, Unilens Vision can distribute up to 5 cents per quarter in the coming fiscal year, increasing to 7 cents per quarter the following year and 8 and 9 cents the years after that. A 5 cent per share quarterly dividend would still leave Unilens Vision with $1 million annually with which to pay down debt or make capital investments, assuming current free cash flow is maintained. Since taking on debt in the share repurchase transaction, the company has reduced its principal value owed to $3.81 million. Market capitalization is $7.76 million and total enterprise value sits at just over $11.10 million. At current levels, the company trades at a very low EV/EBITDA and a very high free cash flow yield. Unilens Vision’s modest valuation is earned in part. The company has not been successful in introducing profitable new products and is extremely dependent on Bausch & Lomb royalties. What’s more, the company’s balance sheet offers little protection. Shareholders’ equity actually went negative after the share repurchase, though it is being rebuilt rapidly as debt is paid down. 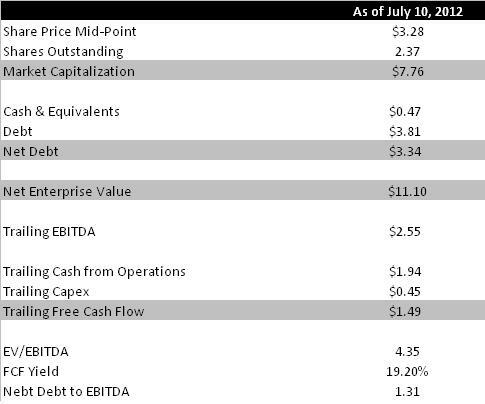 Net debt to EBITDA is reasonable at 1.31 turns. Still, the company’s extremely high free cash flow yield and willingness to return cash to shareholders makes the company attractive at current levels. I view the company as a good buy at any free cash flow yield of 13-14% or higher, or up to between $4.49 and $4.83. Disclosure: I own no shares of Unilens Vision at the time of this writing, but I do have open orders to purchase. Nice write-up. I had looked at UVIC before, but the royalty stream concerned me. Are you optimistic about royalties after 2016? Once patent protection rolls off, I wonder if generic competitors are quickly introduced, and whether Bausch & Lomb can launch its own generic. As a wearer of contacts, I’d say that most people aren’t brand conscious, we all just rely on the optometrists to tell us what’s most comfortable/breathable. I think the royalty stream has a 50/50 or so chance of continuing past 2016. The company doesn’t seem too concerned, or my guess is they would be spending a lot more on R&D. That said, the uncertainty about the royalties is why I would not buy in at a free cash flow yield under 13-14%, or roughly twice the free cash flow yield where stable, well-financed companies often trade. As a fellow contacts wearer, I agree with your point about customers’ indifference to brands. I go with whatever my provider recommends. Without the royalty revenue stream, Operating Income for the last 12 years is -.5mm. A concern considering the relatively high debt and low cash position. Latest Q’s results are not encouraging. “Sales in the disposable lens category decreased 7.6%, sales of custom soft lenses increased 11.0% when compared with the corresponding period.” According to the 2011 10K, “C-Vue disposable products accounted for 56% of sales…We expect that sales of the C-Vue brand multifocal, the C-Vue Aspheric single vision and the C-Vue 1 Day ASV lenses in total will make up a smaller percentage of our next fiscal year sales as sales of our custom soft lenses continue to escalate.”… and sales in all other categories to decline (management forgot to mention this). According to Allaboutvision.com, “Custom contact lenses may be for you if you can’t wear regular contact lenses because of problems such as an irregularly shaped eye or too much astigmatism. So you can bet the general population (at current prices) will not and does not use custom fit lenses. Only those with “hard-to-fit” eyes will consider buying these lenses. This is a smaller market and is not new -meaning there is strong competition ready to duke it out i.e. coopervision hydrosoft. So two of UVIC’s main revenue stream (disposable lenses 40%+ royalty 29%= 69% of revenue) are at risk…. not to mention gas permeable & replacement lenses which are also declining in revenue. Now UVIC’s got to sell a hell of a lot of custom lenses to make up for the loss in revenue. A 11% yoy increase in sales is not good enough. Keep selling UVIC, keep selling. Don’t forget about UVIC’s costs problems and low R&D budget. Disclosure: I am not bashing UVIC. I was genuinely interested in investing in the company. I agree with you on the challenges UVIC is facing. Royalties have been under pressure and the company’s new products are not yet picking up the slack. I am not as pessimistic on the issue of customized lenses and the willingness of consumers to purchase them…I myself require customized lenses and I consider the cost worth it. I am with you, however, on the issue of R&D and debt. The company’s original strategy of levering up to buy back shares and initiate an aggressive dividend was based on a set of revenue assumptions that may look optimistic in hindsight.